Are you are concerned with possible electromagnetic pollution and the associated health risks? Cell phones, tablets, and computers are common sources of EMF, and many well-qualified professionals warn of their potentially dangerous effects. 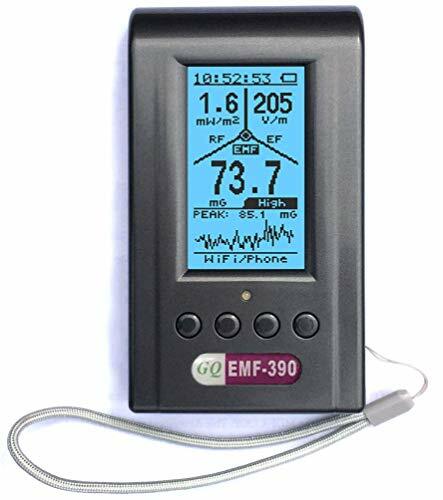 If you are experiencing sensitivity to EMF’s, or if you’re tired of guessing, a reliable EMF meter is the best indicator that you or your loved ones are being exposed. That’s why we bring you our short list of the best EMF meters. The top EMF meters will provide accurate readings and can help you make wise decisions on how to avoid unwanted EMF exposure for your loved ones, or at the office. And when you locate those sources of EMF, you can find solutions in our guide to EMF Protection. 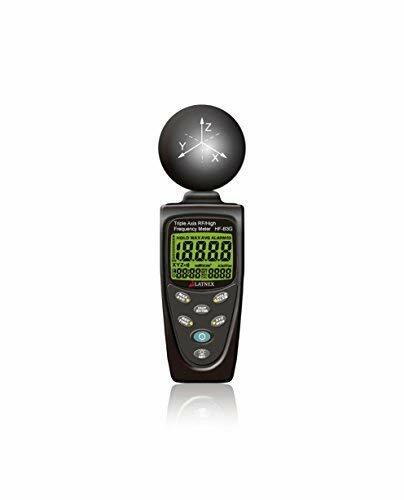 If you want an EMF meter that does it all while providing accurate results, this EMF meter for you. It isn’t a super cheap option, but our research has yet to see a cheap EMF meter that is not full of flaws. You can avoid all those weak points and get reliable readings instead with the Acoustimeter Model AM-10. This meter allows you to check radiation levels being emitted around your home from computers, TV’s, or other electronics. But local cell phone towers and radio towers produce EMF’s that can enter your home as well. If you are considering moving to a new home, this meter can help you make an educated decision. The sensitivity of this EMF detector is a real stong point. Where some EMF detectors require very close proximity to the source, the Acoustimeter model AM-10 can detect signals as weak as 0.02 V/m – 6.00 V/m from a distance. Technical specs of the Acoustimeter are also impressive. With a wide frequency response of 200 MHz – 8 GHz, you can see where potential problems are located. That covers most modern communication systems encountered in our everyday lives. Accurate readings are shown on both a digital LCD display and two series of graduated LED lights. This EMF meter is a user friendly device that offers you everything you will need. Some EMF meters change display readings so fast that it can be difficult to take readings. This is one of the huge benefits of the dual display LCD readings, and the additional LED reading lights provided by this EMF detector. The LED’s update rapidly, and allow you to quickly gauge the levels in an area and find any hot-spots. The LCD display offers accuracy with a slower update speed, giving you time to take note of the readings. It also has a speaker and audio output socket for headphones, allowing you to hear the signal modulation. We are confident with the results provided by the Acoustimeter model AM-10, and we are sure you will be as well. 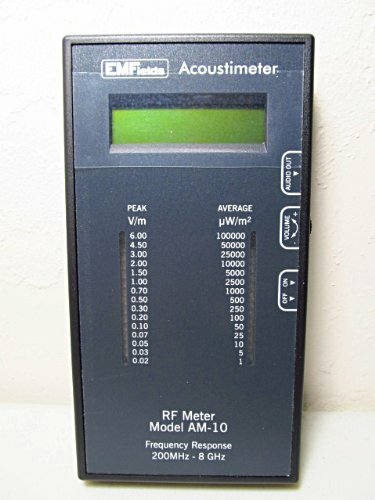 This meter is an excellent tool for locating and identifying high frequency Radio Frequency fields, and low frequency electric and magnetic fields. You can track down those invisible EMF and RF fields at your home or business. You can even help out friends and neighbors while gaining familiarity with the common sources of EMF pollution. The Cornet ED-88TPlus offers broadband measuring with a frequency ranges from 100 MHz to 8 GHz. But it can also measure low frequency magnetic fields ranging from 50Hz to 10kHz, as well as low frequency Electric Fields ranging from 50 Hz to 50 kHz. There are a number of good features you’ll find with this EMF meter. For one, it includes a free hard shell zippered case to keep your meter safe from damage. With sensitive electronics inside, you don’t want to damage your EMF unit and get inaccurate readings, so the hard case is an obvious plus. The digital graphics display is another strong point worth mentioning. The Cornet ED-88TPlus features an LCD moving graphic histogram that provides you with an easy to read signal power level. Additionally, an 8 segment LED indicator provides for ultra-fast readings in a segmented display so you can’t miss those quick frequency fluctuations. The RF readings also provide frequency counter for on air digital RF signals. 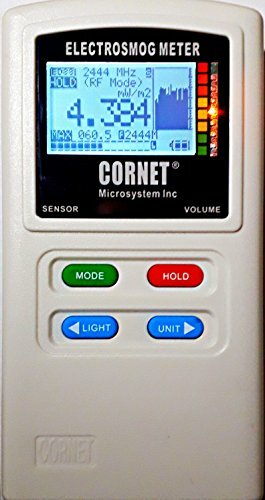 If you are looking for a handy and accurate EMF meter, the Cornet ED-88TPlus is comfortable in the hand with a small, compact handheld design. The EMF meter is battery powered by a single 9V DC battery, or can be externally powered via a 5V USB port. Whether you are seeking to track down a range of telecommunications frequencies, microwave oven leakage, AC power lines, or a host of other EMF polluters, the Cornet ED-88TPlus is one of the best EMF detectors on the market and definitely worth considering. This is a highly sought-after EMF detector that provides a variety of simultaneous graphic readings, making detecting EMF pollution from power lines, smart meters and cell phones super easy. The Advance GQ EMF-390 can be used for EMF, ELF, EF, RF detection and monitoring both indoors and outdoors. If you like the quick readings provided by traditional meters, this EMF detector has a classic analog display feature that provides a traditional needle and indicator reading. But the digital readings of the EMF meter are truly excellent, providing data logging that is timestamped and can be downloaded to a PC for further analysis and record keeping. The Advance GQ EMF-390 offers a RF browser feature. This allows you to visualize the RF radiation precisely on screen. The RF browser shows you high speed RF signal from your smart meter or cell phone transmission while also estimating digital RF transmission data in bytes and RF power in a spectral histogram. You really get everything you need from this EMF detector, as well as a number of helpful features that you worn’t find in other EMF meters in this price range. If you are looking for a good bang for your buck, this is an EMF meter we highly recommend. Multiple high sensitivity sensors installed for detecting Power line, Smart meter, Cell phone, Microwave etc. Identify/recognize the common possible sources, such as Power line, Cell Tower, Microwave, Static etc. Safety suggestion lets you understand current situation instantly. Built-in RF Spectrum analyzer and GQ RF Browser for real time RF monitoring. This meter is a dependable EMF detector with accurate measuring and monitoring, and a reasonable price to boot. The HF-B3G Triple Axis from LATNEX provides a lot of value for both beginner and advanced users. The HF-B3G Triple Axis is designed for measuring radio frequency (RF) electromagnetic field strength. This EMF meter provides useful measurements in a variety of units. Although there is no established safe level of EMF radiation, many believe that environmental readings should be kept below 0.003 μ W/cm2 when at all possible. LATNEX recommends beginners measure with µW/cm2, and advanced users use V/m or µW/m2 as their unit of measurement. This EMF meter will detect radiation being emitted by any wireless devices that are transmitting in the area. So it is worth noting that cell phones, WiFi routers, , smart meters, bluetooth devices, cordless phones, etc. will all affect your meter’s readings. Measuring EMF levels from specific devices must be carried out individually. The HF-B3G Triple Axis provides an amazing amount of detailed information at your finger tips. With data logging that’s downloadable, you can transfer readings to your PC for deep analysis, comparison, and record keeping. The liquid-crystal display is easy to read and is backlit for low light conditions. Users report solid results from the HF-B3G Triple Axis. And when questions arise, the manufacturer provides excellent customer service. 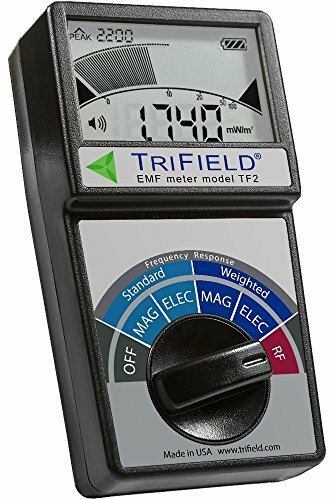 This is a well-qualified EMF meter for the money. The only down side we found to this meter is the frequency range topping off at 3.5GHz. That limitation might leave some 5GHz signals undetected. An EMF detector that ranges up to 8GHz has it’s benefits, but it will cost a little more as well. Overall, HF-B3G Triple Axis is a solid EMF meter for the money. Why Should I Avoid A Cheap EMF Meter? We recommend avoiding cheap EMF meters for a number of reasons. The primary reason is that they do not provide accurate results unless conditions are optimized. For example, take a look at the Meterk EMF meter review below, and notice that no reading is detected even though there is a laptop and a cellphone immediately adjacent to the EMF meter.